Whether you just moved in or are determined to get rid of the clutter in your Jarrettsville home, you can rely on Lehnhoff’s Supply to help you get the job done. Here are some different sizes of roll-off containers for you to consider. Although we are almost in the full bloom of summer, it’s not too late to clean out your home. 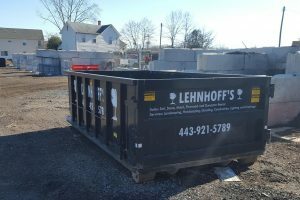 Whether you just moved in or are determined to get rid of the clutter in your Jarrettsville home, you can rely on Lehnhoff’s Supply to help you get the job done. Here are some different sizes of roll off containers for you to consider. Here at Lehnhoff Supply, we are proud to offer you 10 yard roll-off containers. In these containers, you can dispose of debris from your lawn and yard work, and broken-up concrete or asphalt left behind from some hardscaping projects. You can also get rid of leftover materials from any spring construction projects you undertook, such as putting a treehouse or firewood stack together. You can also use a 10-yard roll off container to hold items you are disposing of from various rooms inside your Jarrettsville home, such as from your kitchen, bathroom, basement, or even your garage. Our 15 yard roll-off containers can hold the same types of refuse as our 10-yard containers. The only difference is that you have more room to work with; and that room, believe it or not, can make a noticeable difference. When you are looking to make some large-scale renovations to your home, these containers will help you keep track of the mess and keep it down to a manageable level. Like our 15 and 20-yard roll off containers, you can use the 20-yard roll containers to hold the same types of materials. Do you need to completely replace flooring, roofing, and decking materials over the summer? In that case, you can rent our 20-yard roll containers to help you get the job done quickly so that your house and landscape can become the envy of your Jarrettsville neighborhood once again. Trust Lehnhoff’s Supply and Design for All Your Landscape Supply Needs! Lehnhoff’s Landscaping is delighted to introduce Lehnhoff’s Supply and Design. We seek to fulfill all of your landscape supply and landscape design needs no matter what project you’re looking to complete. We are based in Fallston, Maryland and are eager to lend you our expertise and materials. Find us at 2708 Belair Road, Fallston, MD 21047. Call us at 410-510-7646 or drop us a line via email at lehnhoffsupply@gmail.com. Lastly, don’t hesitate to reach out to us on Facebook, Twitter, and Google+! We serve but aren’t limited to, the following parts of Maryland: Harford County – Fallston, Forest Hill, Joppa, Edgewood, Bel Air, Churchville, Havre de Grace, Jarrettsville, Street, Aberdeen, Abingdon, and Joppatowne. In Baltimore County: Kingsville, Perry Hall, Overlea, Fullerton, Nottingham, Parkville, Towson, Carney, Loch Raven, Lutherville, Timonium, Hunt Valley, Cockeysville, Sparks, Glyndon, Pikesville, Reisterstown, Ruxton, Parkton, Glen Arm, Baldwin, Monkton, Long Green, White Marsh, Rosedale, Phoenix, and Fork. This entry was posted on Friday, June 8th, 2018 at 11:09 am. Both comments and pings are currently closed.